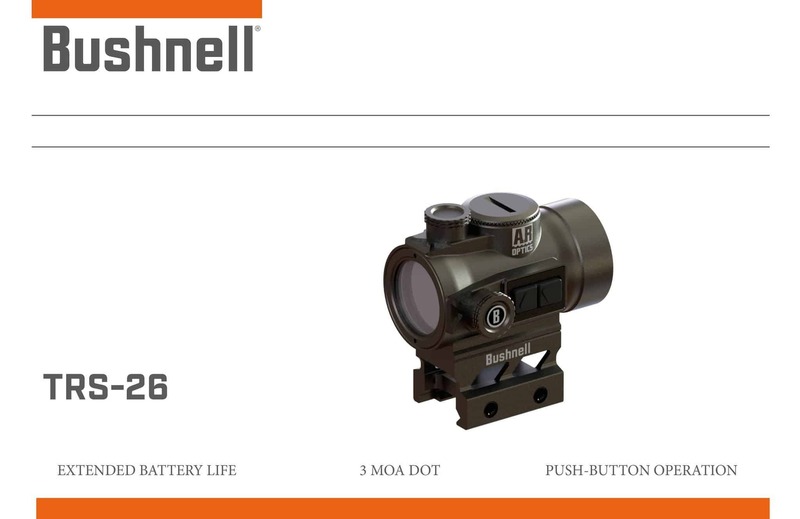 Bushnell introduced the TRS-26 which is the successor of the widely used TRS-25. While the TRS-25 was (and is) a great red dot sight, it had one big downside. And that is the battery life. What’s new compared to the Bushnell TRS-25? The battery life on the TRS-25 was roughly 3,000 hours. This does sound reasonable at first glance but other sights in the market were able to get double that or more. Bushnell addressed this with the TRS-26. The sight has a battery life or more than 10 times that of the TRS-25. You get 50,000 hours out of a battery. That’s roughly 5 years between having to change the battery! Other red dots from other manufacturers sport battery life that compares to that but typically you have to pay quite a bit more. The TRS-26 is priced around the same as the TRS-25, maybe a tad higher. The other significant change to the TRS-25 is that there’s no dial anymore. Instead, adjustments are all made through a push-button interface. To ensure that the TRS-26 is as rugged (if not more) than it’s predecessor, Bushnell has sealed the buttons to the elements to prevent dust or water to be able to penetrate the sight. The TRS-26 improves on the TRS-25 as mentioned above. All the great features that the TRS-25 has, are also to be found in the new model. The objective lens is a tiny bit larger and is now 26 mm in diameter. However, the red dot sight itself is still very compact and usable on pretty much any kind of gun, whether it’s a hunting rifle or a handgun. It certainly will fit great as a perfect match for your AR-15. The red dot measures 3 MOA. As mentioned above, you can expect the battery life to be 50,000 hours which is more than 5 years between having to change the battery. The battery used is a standard and readily available CR2032 button cell. The brightness is adjustable. This enables you to set the level to math the surrounding light. When you keep the brightness setting too high in low light settings you will get a blurry dot which makes it hard to target accurately. The Bushnell Trophy TRS-26 is built as tough and durable as the predecessor was and is. The TRS-25 was known to have those attributes and the new model at least matches them. Bushnell continued to build the sight with a single piece tube. That way the highest level of durability and sturdiness is guaranteed. The sight can be combined with the Bushnell Transition 3x magnifier. You should also have no problems using one of the other available magnifiers for red dot sights from other manufacturers. At the current time not all technical details have been released. Yet, from what is known so far, the TRS-26 will outperform its predecessor and many, if not most, other red dot sights available today. Many of the more expensive sights today for the most part justify the higher price through more features and through a long battery life. The TRS-26 matches or surpasses those features at a low price that is affordable for pretty much everyone! The Bushnell TRS-26 Red Dot 1x26 sight is a great scope for pretty much any shooting style and weapon. It’s a worthy successor of the TRS-25 in any respect. The improvements made by Bushnell are making this one of the best sights available. Specifically, when you consider the price point there’s pretty much nothing that would beat this sight. The image quality is by no means worse than that of any other sight you can get. The sight is parallax free and will hold all settings and zero through many shot rounds. For longer distances you should consider using a magnifier for the sight. If you combine it with the 3x Transition Magnifier from Bushnell then you should have no problems to accurately acquire targets in the medium distance ranges. You won’t be disappointed to get this sight as it’s sturdy and rugged. It will last you for a long time and help you acquire targets quickly and reliably.